I think everyone needs to have a few recipes in their back pocket. You know, for the times when you’re totally in a pinch for time / money / energy but you still need a dessert to bring to a luncheon / potluck / Christmas party? Yep, for cases like these, you need no-bake brownie bites. What exactly are no-bake brownie bites? Well, if the name didn’t give it away, they’re little bite-sized brownies that don’t need any baking. I know, total game changer here. You just might even skip making homemade brownies all together if you knew you could get away with making something that tasted exactly the same but didn’t require heating up the house OR waiting an extra 20-22 minutes when you want that brownie ASAP. Well, I would on most days. My husband REALLY likes these triple fudgy Paleo brownies and he will eat half the pan if I don’t put them away (totally not kidding – he has no self control when it comes to brownies!). But I usually only make those when he specifically requests them. If the rest of us are in the mood for brownies, I prefer to make black bean brownies. I mean c’mon – THEY’RE MADE WITH BEANS! Any guilt I had/have about eating brownies completely disappears when I make those. THANK YOU BEANS! The only downside to black bean brownies (and pumpkin swirl black bean brownies and the fudgy Paleo brownies I mentioned) is that they have to be BAKED. In the summer, that’s a huge no-no. I don’t want to bake in the summer. I don’t want to heat up the house – heck, I don’t even want to be IN the house. I want to be at the pool. Yeah, when it’s one of “those weeks,” turning on the oven to bake brownies is just too much. Even if it’s a simple recipe. I just can’t do it. And then there’s the holiday season. Also known as, bake until your feet fall off and you’ve bought more flour and sugar and butter in one month than you have in one year. As much as I love our tradition of making healthier sugar cookies and healthier candy cane cookies, there comes a point during the holiday season where me and my oven need to take a break from each other. It’s not a break-up and it’s not forever. But to NOT spend several hours on Saturday morning AGAIN baking something for the umpteenth time in the middle of December… and instead sipping on homemade crock pot hot cocoa watching The Santa Claus or Elf? Well, that just sounds heavenly. As does the idea of being able eat brownies without actually baking them. Super cheap. No fancy ingredients here guys – just the store-brand basics. Made in a blender/food processor. Oh yes my friends. We’re skipping the oven AND we’re giving our arm muscles a rest. Incredibly addicting. I ate a whole batch BY MYSELF when we went camping earlier this year. Don’t tell the kids. They think it was Dad! Made with ingredients from your pantry. I’d be SHOCKED if you didn’t already have everything to make these. Freezer-friendly. In case you have extra time today but don’t need these until later, these no-bake brownie bites are perfect candidates for the freezer. Addicting. Did I say that already? Thought so… just making sure. So cute! 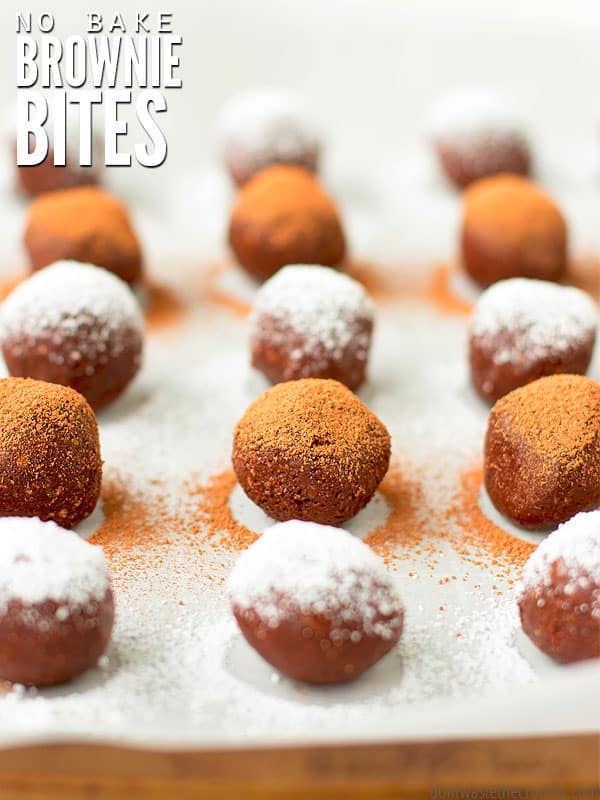 Who doesn’t like eating little balls of chocolate dusted in powdered sugar or GASP! More chocolate? Don’t require refrigeration. If you’re super duper pinched for time, you can skip the fridge altogether. I don’t recommend this in the summer, but in the winter? Go for it. It’s cold enough outside anyway! So Very Addicting. Dotting the i’s and crossing the t’s here. You’ve been warned. We’re taking whole grain oats, whizzing them up in a blender and making oat flour. I chose oats because they cheaper than the einkorn flour we bake with, but also because they’re naturally gluten-free. Oats are incredibly nutritious too! You can substitute with a different flour if you’d like… whole wheat (best if fresh ground), all-purpose (choose unbleached and unenriched), einkorn (good for those with gluten sensitivity), spelt or an all-purpose gluten-free blend (I’ve used this one before). I took a traditional brownie recipe and cut the sugar BY HALF for these cutie pies. They have just enough sweetness to be called dessert, but I promise they won’t leave you in a sugar coma. In our efforts to quit sugar, I used Turbinado when making these. Turbinado has a slightly bigger granule than regular white sugar, so you end up using slightly less. I’m also experimenting with maple sugar, which is a great alternative if you’re concerned about GMO’s and such. The only downside is that it’s pricey. I bought this kind from Amazon, which was the best deal I found. On the other hand, having a pricey sweetener makes me think twice about consuming so much sugar in the first place… just throwing that out there! All brownies – even the no-bake kind – need cocoa. We recently switched to raw cacao and LOVE the rich, dark, indulgent flavor it gives to chocolate-y desserts (this is the one I use). Feel free to use Dutch processed (I like this one) or natural cocoa if that’s what you have. Brownies can’t be brownies without the chocolate! It honestly doesn’t matter what type of chocolate you use here… it can be chips, a chopped up bar or even leftover holiday candy. It’s going in the blender too so it’ll get teeny tiny and mixed in with the brownie bite batter. You can control the sweetness by they type of chocolate you use. Milk chocolate will contain more sugar, while bittersweet chocolate will be less sweet. Since these brownie bites already have sugar, I vote for bittersweet chocolate! To keep these no bake brownie bites allergen free, you can use Enjoy Life chocolate chips. I found them for $4.69 at Thrive Market, $3.94 at Vitacost, $3.74 at Amazon (for Prime Pantry Members). But always check your local stores too. Here’s some comparisons on Costco vs ALDI, Walmart vs ALDI, and Trader Joe’s vs Whole Foods. I’ve found good prices on chocolate at all of them! Both the salt and baking powder is for flavor. I know, it sounds weird to say that baking powder is for flavor, but like my cake batter hummus, we tried it with and without, and with won! Butter is our “glue” in this recipe. If you are dairy-free, feel free to substitute coconut oil. I chose butter because I didn’t want the bites to have any coconut flavor (which some people can taste when you use unrefined virgin coconut oil). By the way, does this list of ingredients sound familiar? It should! It’s essentially a batch of homemade brownie mix, except we’re using oats here instead of flour. 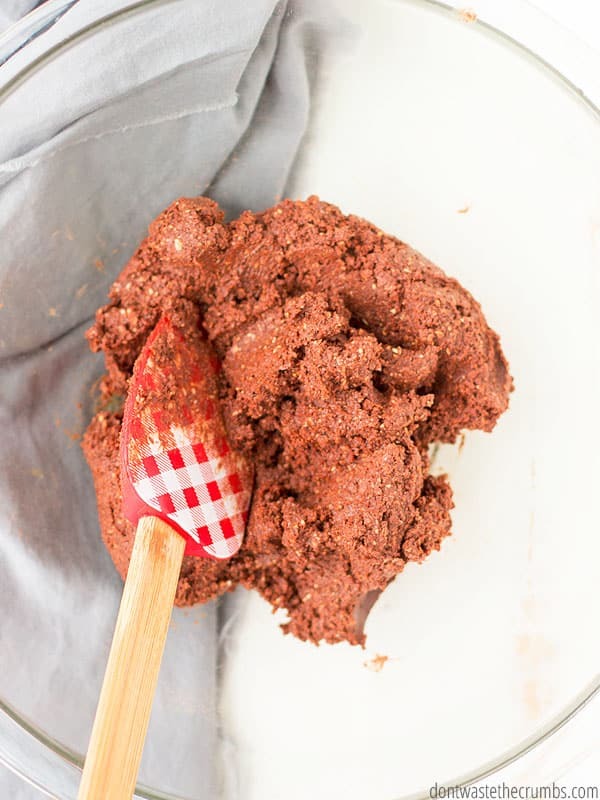 If you already have a batch of homemade brownie mix in the pantry, USE THAT! Ignore the warnings of eating raw flour and go for it. After all, how many swipes of cookie dough have you taken in your lifetime so far? And have you died yet? I decorated my no-bake brownie bites with a dusting of powdered sugar and raw cacao powder. You can use shredded coconut (like this kind), sprinkles finely chopped nuts or colored sugar. Or you can leave them plain too! Whatever suits your fancy. No matter how you decorate them – or don’t – you’re going to love these no-bake brownie bites! Ready to make your brownie bites? This is the blender I use and it hasn’t done me wrong in many years. In fact, I’ve used it in these 45+ ways! If you don’t have a blender, a food processor like this one works great too. I’m kind of a stickler for making my brownie bites perfectly even in size. That is where this cookie scoop comes in handy! I also use it for no bake energy bites, pumpkin larabar bites, and even easy Italian meatballs! Keeping your pantry stocked with baking goods or ready to go mixes helps you save money on groceries all year long. It’s one key element of my grocery savings system that has worked for years! 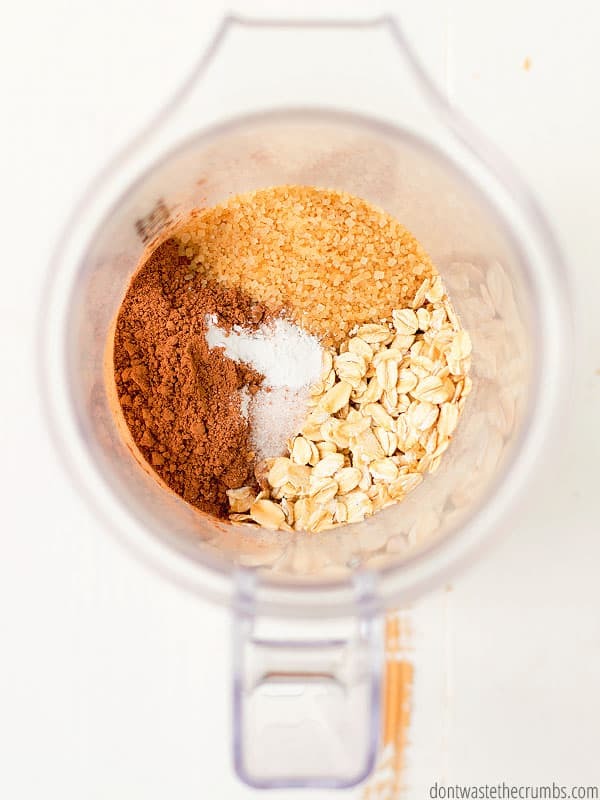 Combine the sugar, cocoa, oats, salt and baking powder in a blender. Process until the mixture resembles coarse breadcrumbs, about one minute. 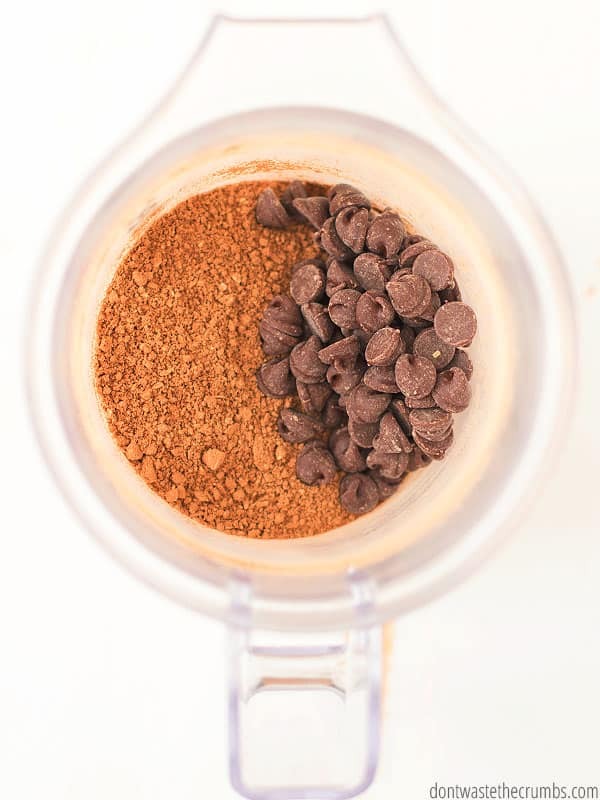 Add chocolate chips and process again for about 30 seconds. Place the soft to slightly melted butter in a medium sized bowl and add the dry ingredients. Use a spatula to mix everything together really well. 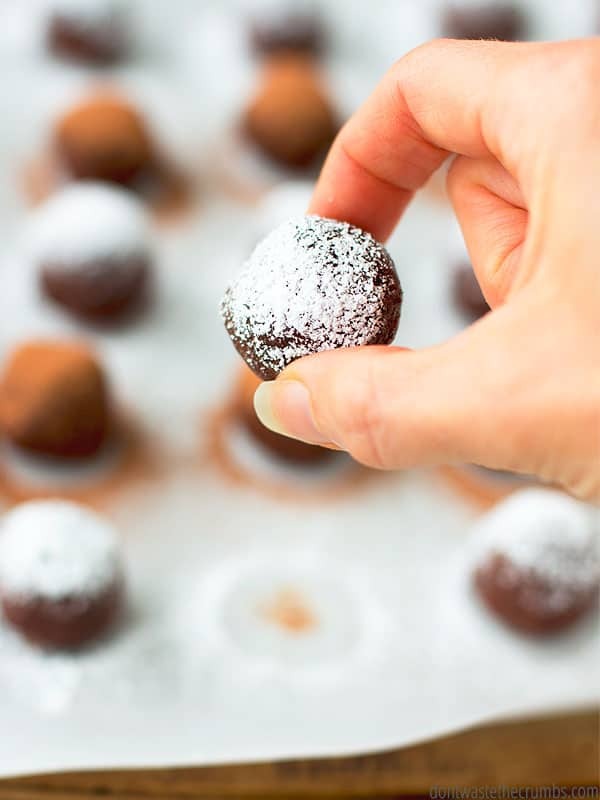 Using a cookie scoop (this is the one I have), scoop out balls of brownie, roll them into a ball in your hands, and place on the parchment paper. Repeat the process with the remaining batter. 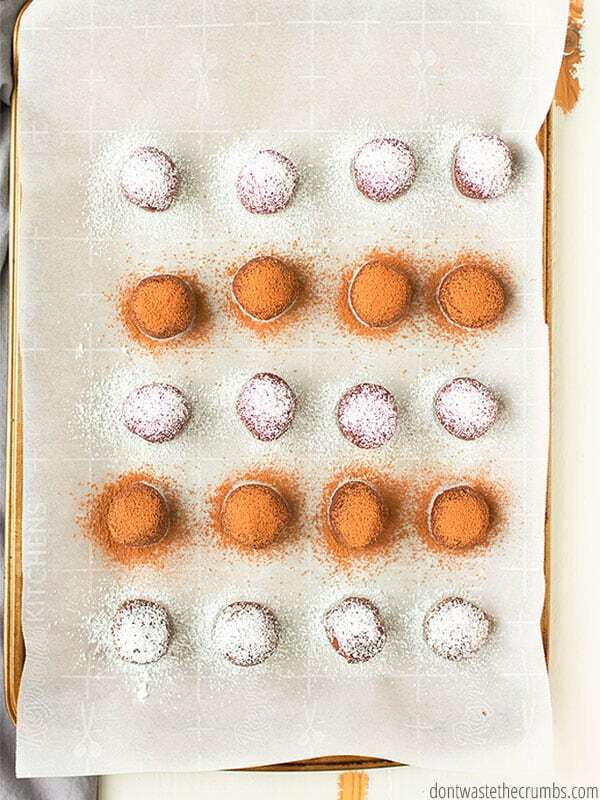 If desired, dust the tops of the balls with powdered sugar, cocoa powder, coconut flakes, sprinkles or press in mini chocolate chips. They are ready to be served immediately, but for best texture, refrigerate for 15-20 minutes. Store the brownie bites in the freezer if they’re not consumed within a few days. What’s your back pocket, go-to recipe when you need to take something to a party? Leave your favorite ideas in the comments section below!